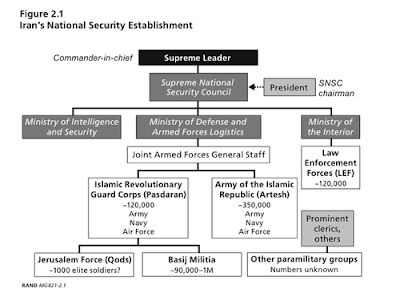 As noted in some previous posts (including this one), the heart of Ahmadinejad's institutional and ideological base lies in the Revolutionary Guards (IRGC), along with the intelligence services and the paramilitary Basij militia. I suppose that, for the sake of handy though imprecise analogies, one might think of these roughly as the institutional equivalents of the SS, the Gestapo, and the Storm Troopers. * Or, to put it another way, Ahmadinejad's key role has been to serve as the political representative of these forces, and his rise to power has been part of a larger process by which the Revolutionary Guards, in particular, have come to play an increasingly central role in the power structure of Iranian regime. * To avoid possible misunderstanding about the implications of this analogy--and to pre-empt unnecessary squawks from the politically correct--it might be worth adding that there is no functional equivalent for the Führer. Yes, there is someone called the Supreme Leader, Ali Khamenei, who is the most powerful single individual in the system. But Khamenei is no Hitler, Stalin, or Saddam Hussein--not even a Mussolini or a Hafez al-Assad. The Iranian regime is a profoundly authoritarian system--with quasi-democratic elements, as we have seen--but not a personal dictatorship. Here is a beginner's guide to the structure of the Iranian regime's coercive apparatus (from RAND via NIAC via Andrew Sullivan). (A compact analysis by Sazegara himself is here.) It appears that, over the past decade and a half, the IRGC has increasingly become the backbone of the regime. Supreme Leader Ayatollah Khamenei strongly promoted this process. Does the IRGC continue to function as his instrument, or might he soon find himself in the position of the sorcerer's apprentice? That remains a matter for speculation, but if the June Coup proves to be successful, the outlines of the answer may become more clear over the next few years.